Suresh Khanapurkar, a retired geologist, is a staunch RSS supporter and Amrish Patel is a Congress leader in Maharashtra. But their conflicting political ideologies did not stop them from joining hands to quench the thirst of a drought-prone region in the state. In 2004, they started work to provide irrigation and drinking water to 35 of the 149 villages in Shirpur taluka of the state’s Dhule district. Their hard work over the past eight years has resulted in steady increase of the once-depleting groundwater level. Farmers, who used to migrate after monsoons in search of work, now stay on in their villages to grow two crops a year, instead of one crop. What’s more, drinking water is available to all households in the villages, thanks to installation of pond pumps. The money for their effort comes from the profits of a cooperative cotton mill started by Patel. Since 2004, Rs 6.55 crore has been spent on their project which spreads across 150 sq km. Six months after his retirement from government job, Khanapurkar started the conservation work in Shirpur. Patel had noticed his work during the inaugaration of a water conservation project in Shrigonda taluka of Dhule district in 2003. Impressed, he offered him to spearhead conservation work in Shirpur. 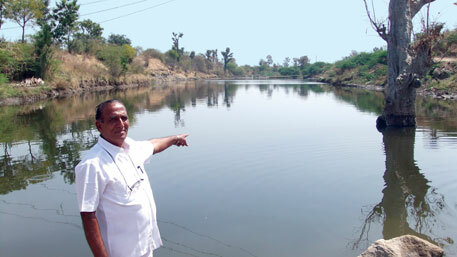 “I agreed and immediately started surveying all the nullahs, streams and water bodies in the 35 villages of the taluka,” says Khanapurkar. The region is mostly dry, receiving south-west monsoon for a short period. About 75 per cent of the rainfall occurs during 13 of the total 36 days, and surface water sources are unevenly distributed. Irrigation projects cover only a small area in the south-eastern part of the taluka. Geologically, a third of the total area of Shirpur is covered by Tapi alluvium and the rest by Deccan basalt. Tapi alluvium is composed of alternate layers of yellow silt, sand and boulders, while Deccan basalt has levels of weathered, hard massive basalt. Aquifers are present at various levels in both the belts, but alluvium takes more time than basalt to recharge an acquifer. “About 30,000 farmers used to indiscriminately withdraw groundwater from the system to grow crops,” says Khanapurkar. In the absence of any regulatory measures, groundwater was being extensively exploited, resulting in its fall. “Drinking water schemes were the first casualty,” says Khanapurkar. Due to the decline in groundwater, dug wells in the Tapi alluvium belt dried up in 1990. Since alternate layers of silt in alluvium pass on very little water, the situation was becoming critical with each passing day. Even after heavy rainfall the wells were dry. “This clearly showed that there was little lateral and vertical percolation of water through the yellow silt,” says Khanapurkar. In the basalt belt, due to the nature of rainfall (heavy rainfall in short duration) runoff and little percolation, aquifers hardly got saturated despite having effective porosity. “Because of this dug and bore wells in the region had water only till December,” says Khanapurkar. Drying of wells in the alluvial belt and insufficient availability of water after December in the basalt region were the main problems of Shirpur, he adds. After studying all the geological aspects of the region, Khanapurkar chalked out a plan—angioplasty in water conservation. Fourteen small streams in the project area were widened five metres to 30 m and deepened from 10 m to 15 m. “It is like a surgeon widening blood vessels for adequate blood supply. Hence, the project’s name,” says Khanapurkar. The extension removed the impervious layer of yellow soil and hard massive trap of basalt. They also built 65 cement bunds on the streams. Their minimum storage capacity is 280 million cubic metre (MCM) while maximum is 4,240 MCM, informs Khanapurkar. To recharge aquifers in the project area, surplus water from dams was injected into 59 dry dug wells with depth of 50 m. As a result, water level in the basalt belt has risen by 140 m after declining to 150 m. While in alluvial area, water level has risen by 110 m after declining to 150 m. “Now the streams hold water till March, unlike before when they would dry by December,” says Khanapurkar. The water revolution has drastically changed the lives of the farmers in the taluka. Their average per capita income has increased by Rs 1 lakh per hectare annually. Farmers are harvesting double crop in rainfed and non-command areas. Low energy pond pumps have decreased power consumption of the villages as they run on diesel. Many farmers have also started fishing in the nullahs, which provides an additional source of income. Atmaram Rathod and his brother, Premraj, who own a hectare in village Nageshwar Bangla, used to work in Pune to support their family of six. Since the project was initiated, they have started cultivating groundnut, tomato, brinjal and cotton on their land. They earn Rs 4 lakh per year as opposed to Rs 1 lakh after toiling in Pune. “We used to grow bajra in our farm, that too when rainfall was sufficient. Rest of the year, we used to do petty jobs in big cities,” recalls Premraj Rathod. Surendrasingh Rajput owns four hectares in his village Godi. Till 2008, he used to earn Rs 30,000 every year from farming. “My fortune changed in 2008 when the nullah adjoining my farm held water throughout the year. It was first time in my life that the nullah did not dry after monsoons,” he recalls. Khanapurkar says if his water conservation model is adopted in the entire state, villages in non-command and rainfed areas will be able to grow two crops a year. “If the project is implemented everywhere, there will be no incident of farmer suicide,” he believes. This is wonderful work. I sincerely hope more politicians will set aside their differences and support true progress. Water is the most precious resource for humans and other earthlings. We need to learn to use it and save it properly. Yes, this should be the trendsetter, most of our country depends on monsoons, such type of planning would up-to some extent reduce the dependency on monsoons. Another lessons to be followed is to forget the political aspirations and just concentrate on the overall development. Such useful informations should reach villegers all over India. I would like to have the contact details of Suresh Khanapurkar and Amrish Patel so that we can do a small story on this project. Commendable work by the duo. Commendable work by the duo. I am also a geologist with plus 30 year experience and am proud that the person from my fraternity has given comfort to the starving society. A very commendable work indeed. This technology of water conservation should percolate down to other similar villages in the country, and not become isolated case.Avery majority of the region coming under Deccan plateau shares similar geological and geographical aspects, and if these techniques are taken there they can also be benefited. This is really great job done. Helping mankind at this level requires vision and determination. And Mr.Suresh Khanapurkar is a living example. Sir i really salute you. You are inspiration for all who want to do something good for people. I wish our politicians are also inspired. I learnt that Shri Sureshji Kanapurkar have proposed the project of converting Jalna Water Reach by just investing Rs.10 Crs. We should solve our problems. All the stake holders in Jalna should contribute & mobalise the funds of Rs.15 Crs. Under the leadership of Shri Sureshji the as per his vision & working style he should implement the project which will make Jalna full of drinking water & water for the irrigation. We can definitely increase water table by at least 15 feet in Maharastra. Sheti Udyog Bhandar swargate Pune 411042. Great work due to real collective effort. Politics must be kept aside at least for water issues which is directly linked to the survival of people.India can become superpower because the basic mindset of people is good, we just need someone to use them effectively & honestly for development of our country. tumhi great aahat, tumhi hati ghetlele karya mahan aahe aamchaya sanvanchya tumhala hardhik subhecha. This is what Dr. Hedgewar expected from every swayamsevak and this work is the real meaning of being a swayamsevak.